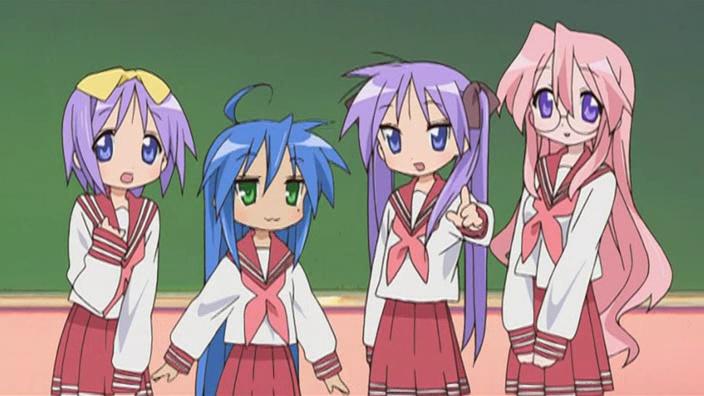 The plot centers around your 4 average Japanese high school girls, Konata, Kagami, Tsukasa and Miyuki. However, it mainly focuses on Konata who, despite having good athletic and organization skills, is lazy and would rather spend her time reading manga, watching anime, or playing video games than studying for her subjects. As Konata is a big anime fan, there are a lot of anime references in this series, including A LOT of Haruhi Suzumiya and many surprise appearances of the main character from Code Geass. As the series progresses, more characters appear in the series. The animation is very cute and remains that way throughout the series. The characters have bright hair and eyes, and the background is just your general background. There’s a funny reference in one of the later episodes where two of the new characters mention that they're just “part of the background” and their colour turns dull, so that they blend with the background, which is funny! The opening theme can either be liked a lot for its absolute randomness, or you can find it highly irritating. It’s completely different to what you'd normally hear for an opening theme. The lyrics are random, they have a random conversation as the “bridge” and then it gets to the main chorus. Personally, I love the music! Since this isn't exactly an action series or romance series, only basic music is played, however the music can be random when it comes to a comedy moment. The sounds are quite unique, what I mean is when the characters have a “sweat drop” moment, the sound made for it is different to what is usually heard. For the ending themes, the first 12 episodes are of the four main characters performing a karaoke of popular anime opening and ending themes, or Japanese singles. Some examples are “Cha La Head Cha La” from Dragonball Z and “That’s Love Right?” from Full Metal Panic! Fumoffu. After the random karaoke, the ending themes are...well...boring in my opinion. Most of them have Minori Shiraishi doing a random stunt somewhere, like on a cliff near the sea singing the main opening theme or something. I have no idea why they changed it to that; I loved the kareoke! I wouldn't be reviewing this series if I didn't love it! I love the random comedic moments, and every Saturday I HAD to check online for the new subbed episode. The fact that there isn't that much plot in it is a good thing, because you can watch it when you want without missing too much. The first 5 episodes I found quite boring compared to the later ones, in the first episode they spent about 5-10 minutes talking about how they eat ice cream and other foods. Thank goodness the light comedic conversations aren’t as long later on in the series. Overall Score - Overall, it’s a hilarious series, I absolutely loved everything about it, but it is hard to understand if you’re new to anime or if you don't know much on Japanese culture, so this gets ­ 79/100.